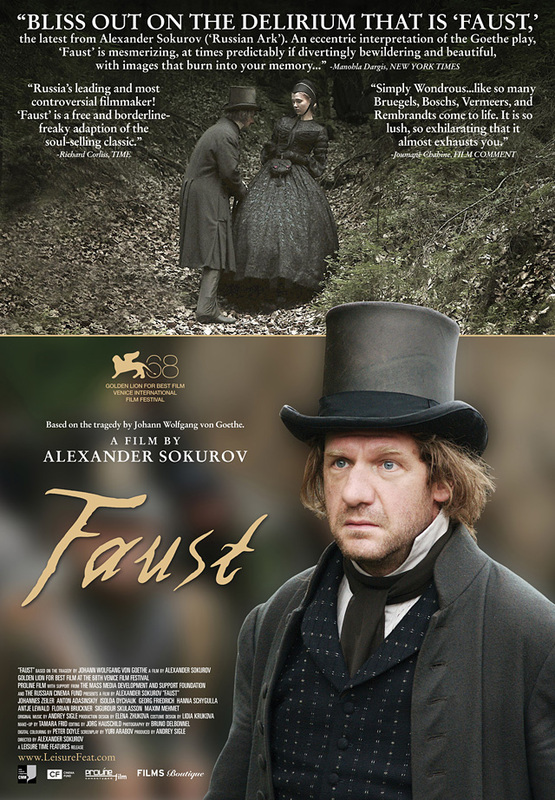 Winner of the 2011 Venice International Film Festival’s Golden Lion, FAUST, Alexander Sokurov’s latest film, is an hallucinatory period piece set in the early 19th century and inspired by Goethe’s famous play. Read the full rave FILM COMMENT review here. “Simply wondrous. Like so many Bruegels, Boschs, Vermeers, and Rembrandts come to life. Employing elaborate camera movements, a dense soundscape, intricate production design and spectacular locations, FAUST conjures up a unique and phantasmagoric vision of the Faustian legend. Faust, played by Johannes Zeiler, is a man in search of the ideals of the Enlightenment but he becomes obsessed with the lovely Magarethe (Isolda Dychauk) and eventually sells his soul to the Devil (Anton Adasinsky) also known as the Moneylender, so that he may possess her. Comic, cosmic, painterly and stunningly beautiful scenes abound as the Devil takes Faust on a strange, unforgettable journey that ends in Hell itself. The story of FAUST is one of the most popular in western literature – there is the opera, play, movies and countless other adaptations. FAUST concludes Sokurov’s ambitious “Men of Power” tetralogy, which includes films on Adolph Hitler (“Moloch” 1999), Vladimir Lenin (“Taurus” 2001) and Emperor Hirohito (“The Sun” 2005). Russian President, Vladimir Putin, helped provide government funding for the film, and German actress Hannah Schygulla makes a cameo appearance as the Moneylender’s Wife. Sokurov’s FAUST also features the exquisite cinematography of Bruno Delbonnel, cinematographer for "Harry Potter and the Half Blood Prince", Tim Burton’s "Dark Shadows", "Amélie", and the upcoming Coen Brothers film "Inside Llewyn Davis".